The song comes from the talented Thorunn Antonia who was more than happy for us to use it. Thank you Thorunn, Hermigervill, Berndsen and Oculus and Sena for the music! (See more of her music on the ** thorunnmusic ** channel here on youtube. The Reykjavik and countryside and Blue Lagoon footage comes from Icelandic production company Sagafilm (thank you! ), and Pride footage is supplied by Hrafnhildur Gunnarsdóttir @ Krummafilms. The video was edited by Davíð Jónsson and scripted and directed by Hannes Sasi Palsson. Spread the love – share the video! The documentary, Kitchen sink revolution won “Einarinn” the public award at Skjaldborg Film festival 2015. The film is a sequel to another film by Halla Kristin Einarsdottir, “Women wearing red socks”, which also was awarded the same price in 2009. 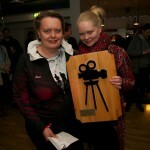 Hrafnhildur Gunnarsdottir produced the film on behalf of Krumma Films.